SPEED LIMIT 5mph on Site Access Track and Campsite. - track used by Pedestrains / Horse Riders / Vehicles: see News Section. Rough Close is a 43-acre campsite and activity centre located 4.5 miles from Coventry City centre on the western outskirts of the City. Access is via a gated private drive from the B4101, Tanners Lane, Berkswell. 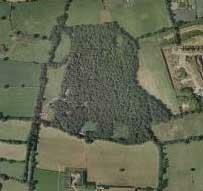 The site ranges over 43 acres of ancient natural woodland, which is criss-crossed by tracks and paths. This woodland together with its abundant wildlife make an ideal Scout campsite enjoying the peace and quiet of the countryside whilst being within minutes of the City's urban civilisation. The camping areas comprise of 2 large fields, 4 smaller fields and 10 pocket sites. Toilet and shower facilities are available with both hot and cold water. The 'Norton' Cabin has indoor accommodation for 22 people, three bunk rooms each of six and two leaders room each of two, a fully equipped kitchen and an activity room. The 'Ma Williams' Cub Field is adjacent. The 'George Sheppard' Cabin has a day room for training or section meetings and a fully fitted kitchen, the Scout Training Field is adjacent. The 'Guild' Cabin has a day room and kitchen with the Guild Field adjacent. A camp fire circle provides for traditional camp fire at the end of the day and a 'Chapel' for members of any faith who wish to enjoy a 'Scouts Own' or just a period of quiet contemplation. Some of the activities available are: Archery, Crate Climbing, Air Rifle shooting, Pedal Cars, Traverse and Peg wall, Orienteering, Cavebus & Frisbee Golf. The Reception Office is open from 6:00pm Friday's, when keys for Cabins booked can be collected.